If you are not a fan of Calvin and Hobbes, a comic strip written and illustrated by Bill Watterson, then you may not know that Calvin was an imaginative little boy who created snowmen and put them in scenes that would be straight out of a snowman’s nightmare. 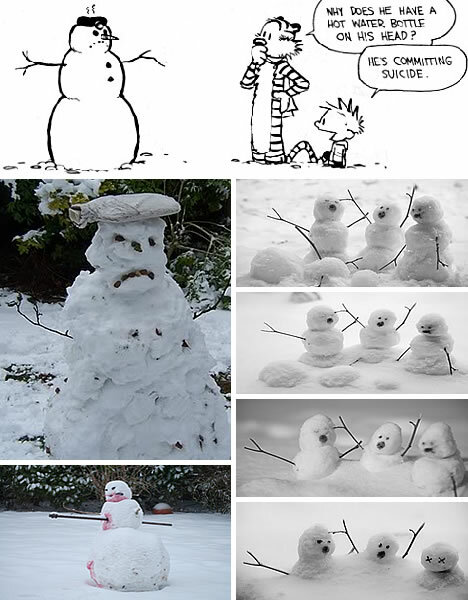 Little Calvin would have the snowmen in scenes where the snowmen would die horrible, mostly painful, deaths. 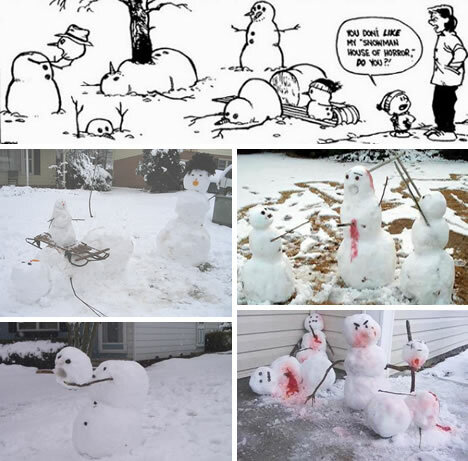 For ten winters, Calvin and Hobbes created entire worlds of snowmen living or dying in unhappily ever after ways. 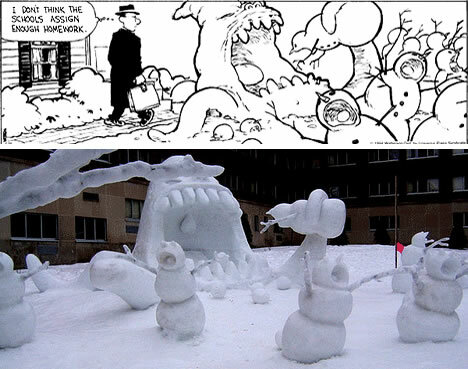 Here are some of the best snowmen nightmares, where fans of the comic strip created tributes to Calvin and Hobbes snowmen in real life. If you decide to build a snowman, then perhaps you should startle your neighbors and people who drive by. The first thing you should know is that the snowman should not be set in a smiling and happily ever after scene. 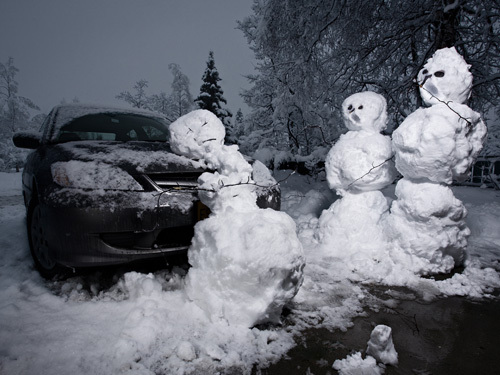 Think along the lines of what would be a snowman’s worst nightmare. If you have a dark sense of humor, then it will be easy. 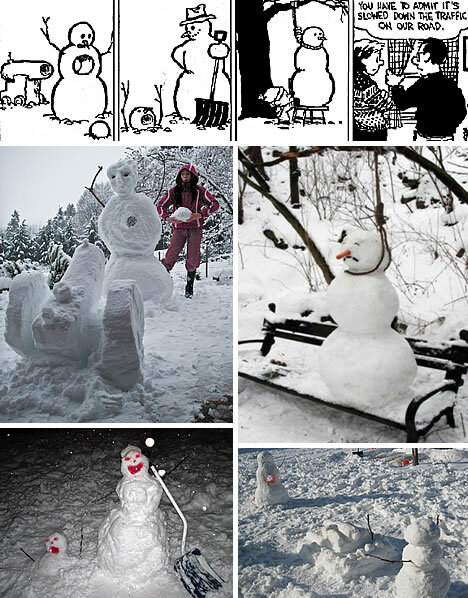 If you need some ideas, take a look at the Calvin and Hobbes comic strips and snowmen below. Hobbes asks, “Snow sharks?” Calvin replied, “That guy’s a goner.” Snow snarks have popped up all over the world to eat snowmen since that time. There were also snow snakes, same idea, the snowman is about to die a horrible death. 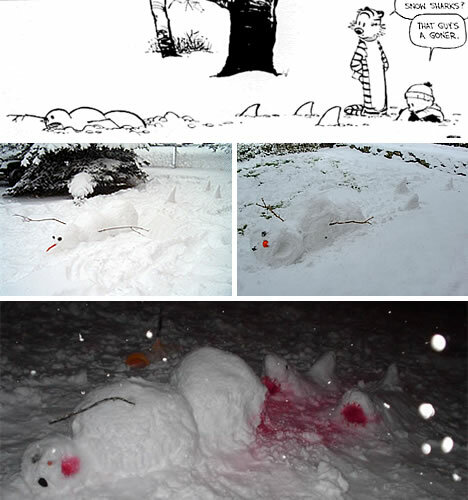 Calvin built many tiny snowmen. Some he crushed while pretending to be a Tyrannosaurus. His tiny snowmen also ran from T-Rex, committed suicide by jumping from Calvin’s bedroom windowsill, and were created simply to grate on his dad’s nerves like the normal-sized snowman yelling at all the little ones. 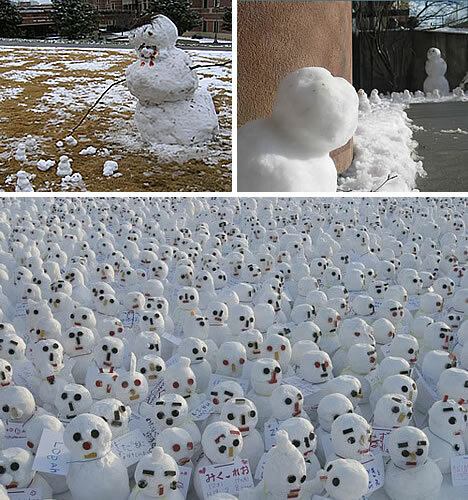 If you want the tiny snowmen to be eaten by a larger one, want to create an entire army of tiny snowmen, or want to create an invasion of tiny snowmen, go for it. 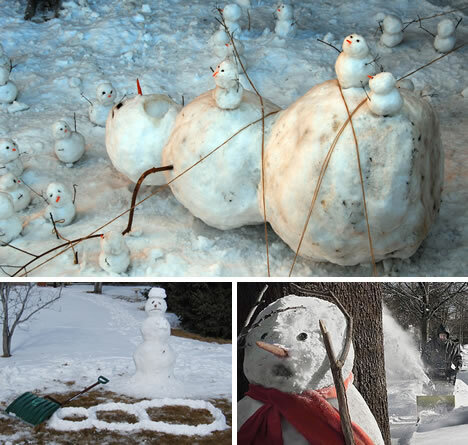 You will have fun and people may stop to stare or to take pictures of your winter handiwork. In yet another of Bill Watterson’s comic strips, Hobbes asks, “Why does he have a hot water bottle on his head?” Calvin replied, “He’s committing suicide.” So whether your snowman scene depicts a suicide in progress, snowmen being murdered, eaten, or melted, as long as it ends badly for the snowman, you are embracing the Calvin and Hobbes snowman series. Keep in mind, that is must have an unhappily ever after theme. Building a snowman is an environmentally-friendly exercise. 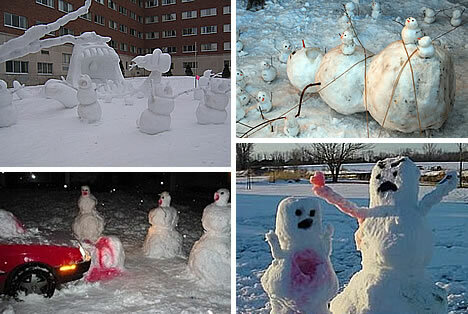 In this case, think murder and mayhem to snow-people and you are on the right track. Some people step outside the comic strip box and throw in a dash of CSI. 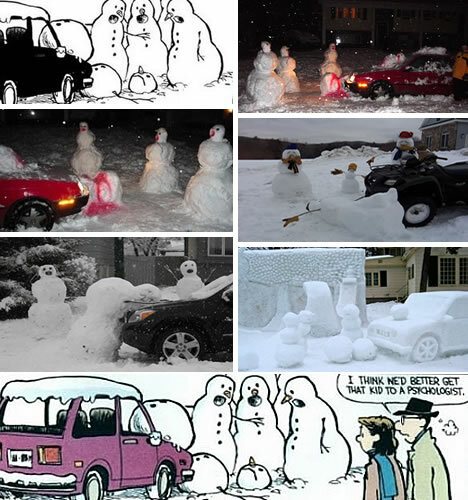 In any case, think Calvin and Hobbes when you next build a snowman. It will keep you laughing through the cold winter blues and keep your neighbors guessing about you. 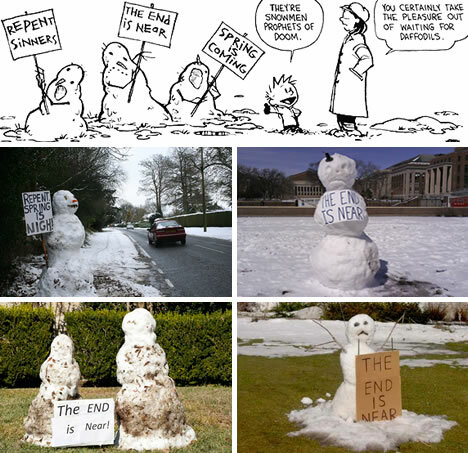 If you are still stuck without an idea of what a snowman might consider a nightmare, or what the comic strips might mean, look here at snowmen wiki page. Here is a great collection of Calvin and Hobbes comic strips. 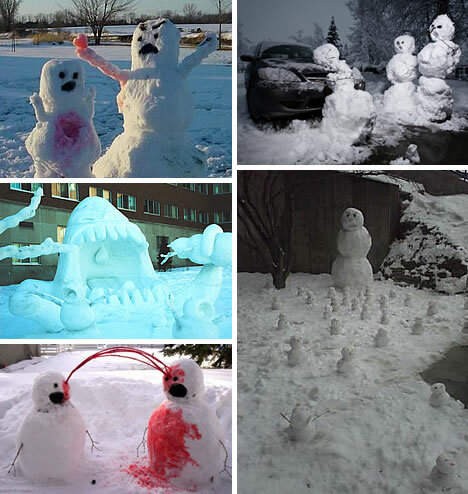 Have fun with it and show your snowman affection in a funny yet twisted way.